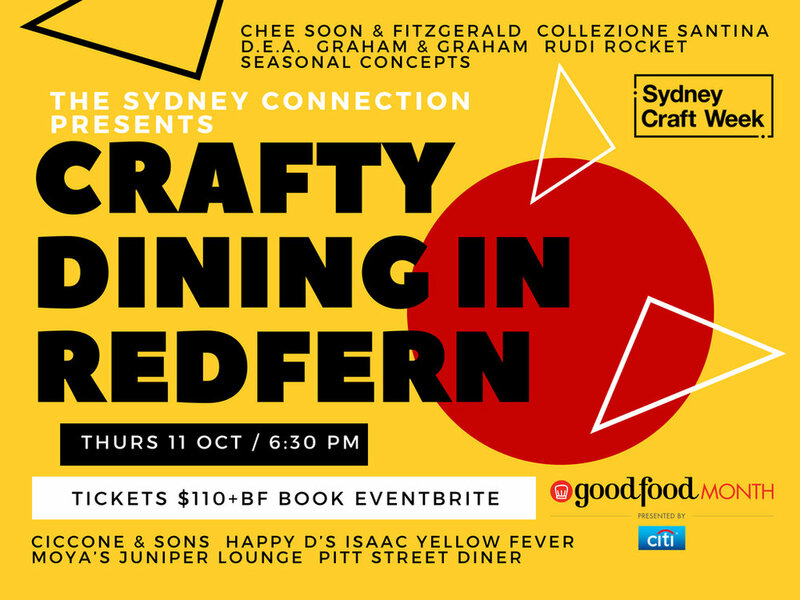 We are proud to announce our second Crafty Dining Dining experience as part of Good Food Month and Sydney Craft Week. This time we are heading for Redfern where we will showcase the rich variety of contemporary design, vintage furniture, textiles and dining options on Regent & Redfern Streets. Each participating design store in Redfern has been matched with a local restaurant, who have created a menu of tasting dishes to compliment the stores aesthetic. Before dining instore guests will listen to a short talk from each owner operator about the establishment of their store, the process of selection and their design favourites. Indulge in an especially crafted gin cocktail by Moya’s Juniper Lounge on arrival and a delicious Ciccone & Son’s gelato to finish a unique inner city evening. In the lead-up to the Surry Hills Festival, Surry Hills Creative Precinct and The Sydney Connection proudly present our first Surry Hills Spring Tasting Trail. Showcasing the Devonshire and Crown Street precinct as a premium inner-city dining destination for locals & visitors alike. Highlighting the diverse range of cultures and cooking styles available in the hood. Kick-off with a vino and antipasto at Essenza Italian or Thai treats at Muum Maam, right in the heart of the restaurant sector of our vibrant inner city community. Then spring from one restaurant to another, visiting three other venues, with your local guide and experiencing an entrée size dish at each. Finish the evening with a decadent dessert cocktail or a well-dressed gelato and a new group of food-loving friends.